There are as many ways to make Latkes, as there are Jewish homes. Everyone has their own style and preferences. Here are mine. Aloevera juice and ice-water on hand for when you burn yourself, and you will probably burn yourself, I do and I’m a seasoned pro! So, I hand peel a lot of potatoes, uggghhh! It takes a long time and you have to be careful not to get your fingers grated in the process. I have made them with a food processor, but I have to tell you, the grater gets the potatoes thinner and into smaller pieces that cook quicker and absorb slightly less oil. You can make your own decision about this. I never bother peeling the potatoes, but I do clean them really well and remove any bad spots. Use a big bowl for this. I have also experimented with grating them into water and straining them. I’ve concluded that this particular idea is just one more step in a long and intense process, and it doesn’t seem to make any real difference. So, I no longer do it. I just grate them into a big bowl and try and pour out as much of the potato juice as I can. I add the juice of one or two lemons, depending on how many potatoes I’m using, and stir that up, then I grate two or three carrots. The ratio of carrot to potato should be 1:4. So, one carrot for every four potatoes, for the non-math oriented folks. Since I am one of those kinds of people, it’s always a good idea to repeat myself when numbers are involved. You may have noticed, I rarely give exact amounts or numbers of things in my recipes. My apologies, I just don’t do numbers very much or very well. It’s an organic kind of thing in my kitchen with amounts shifting all the time. I throw in some chopped parsley and freshly pressed garlic (remember to remove the center parts, see Esti’s Parsley Sauce for pictures), lots of salt and pepper and then about 7-10 eggs and a bunch of larger crumbles of feta. If you are making these gluten-free, then you are done with the batter. If you want to add some Matzo Meal or flour then go ahead and put some of that in. I’ve made latkes so many different ways. I have not yet experimented with coconut flour or almond flour to see how that works. I usually just go flour-less, since so many folks are not eating wheat or gluten these days. You then will need three frying pans, four is too many to manage. If you use only one or two, good for you, it will take you another hour to be done, but you probably won’t burn yourself and need the aloe. Since I am always making these for a crowd, I am the three and sometimes four frying pan kind of woman. You can use any oil you want, but this recipe is about frying things in hot OIL. Oil-rich foods are traditional for this time of year and this holiday because they are an additional way to get oil into our celebrations. The oil connects us to the miracle of the sacred oil lasting for eight days in the re-dedication of the Temple that is part of our traditional Hanukkah story. So, frying foods in oil and having lots of oil is just part of the holiday. I alternate between olive oil and coconut oil, depending on which I am more in the mood for. Both flavors are good. Heat the oil to medium high, you can turn it down once you get going, but it needs to be pretty hot. Have lots of pot holders on hand and dishtowels on hand. Have two or more trays in the oven with cooling racks over them so you can put finished latkes on the rack and let the extra grease drip onto the pan below. Keep the oven on 250º so the latkes you’ve made stay warm, while you keep frying the rest of them. This is the tricky part and the time-consuming part and the get yourself burned part. I wish I could say there was another way to do this, but basically, it’s a labor of love or love of tradition or some form of craziness. Take a slotted spoon, or a 1/2 cup measure and ladle the latke batter into three or four patties in the hot oil. Let them cook for a good five minutes or more per side, depending on the thickness. Smush them down so they are flatter after you turn them. I sometimes turn them too soon and then they are not golden brown and so I have to fry them on that side again. The speed of this process and the timing are pretty hard to get down perfectly. It’s sort of a dance between flipping, checking, frying, ladling and then putting them on the trays in the oven so they stay warm until you are done. If you want to be just a servant to your guests, you can omit the keeping them warm in the oven part and just fry them and then dish them out. People always say they only want one or two, but end up eating four or more. I promise you they will eat more than they say they will. There’s just something deeply compelling about a latke, cooked properly and served hot. You can serve them with applesauce (see my recipe) and sour-cream, with Esti’s Parsley Sauce and Greek yogurt, with hot-sauce of your choosing, with whatever condiments you like. There will rarely be left-overs, but if there are, they are good with eggs the next morning. Apparently, if you cool the potatoes the night before, by putting them in the fridge, they cook better. This is the tip I got from the appliance repair man who was over at our house this morning. I cannot verify this, but am putting it in as a tip that may prove to be true. I only make these ONCE a year and last night was the night, so my testing this particular theory will have to wait. You can let me know if it makes a difference for your latke frying. 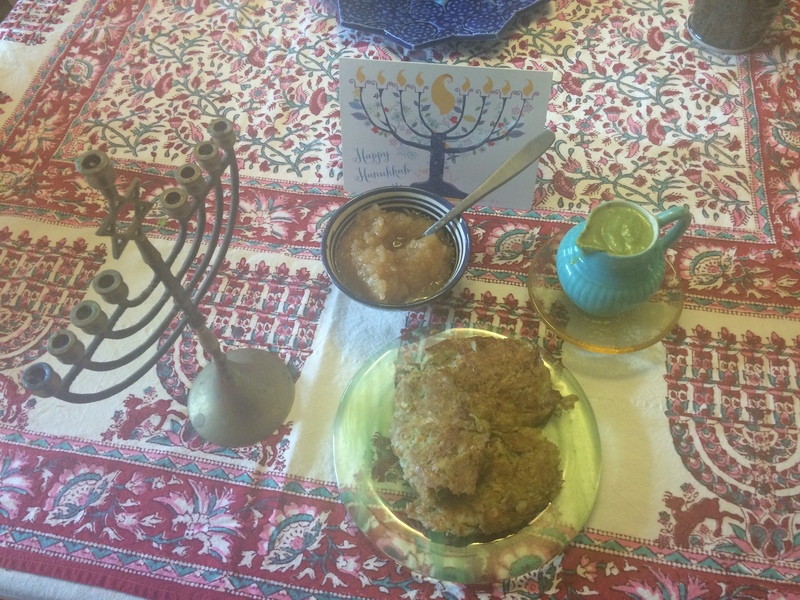 To survive Latkes, only eat them one of the nights of Hanukkah, not all eight! Or make sure you eat lots of bitter greens (like mustard greens) or radishes, daikon is my favorite, and lots of green salads as well. This is the secret to making your tummy happy with vegetables and flavors that compliment the fat-oil zone you get into this time of year by over-eating latkes. You can also substitute yams for the potatoes, but those are very different tasting, and still need to be cooked in lots of oil. Also, if you want a different/alternative Hanukkah story, check out my Midrash, The Woman Whose Pockets Gave Light.